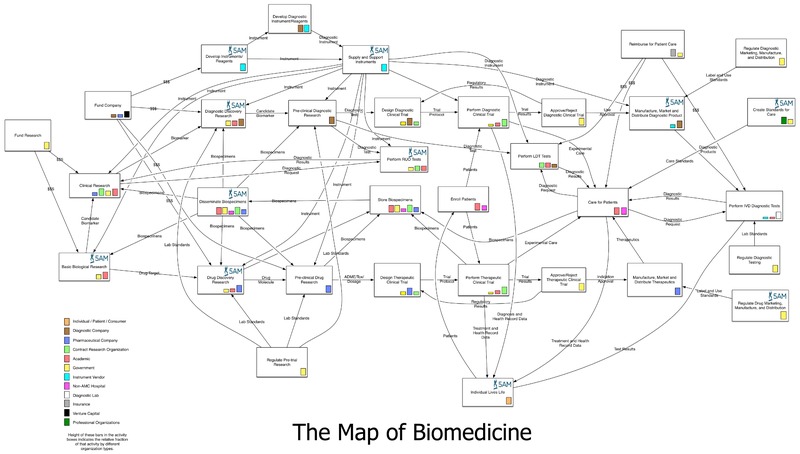 As I said in my introductory post to this series on the Map of Biomedicine, there’s incredible value in being to able to understand how things operate at a high level and also be able to drill down and see details. 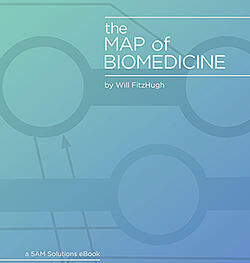 At the end of that post I showed a picture of the Map of Biomedicine that I’ve been working on. We’ll get back to talking about the overall map later, but for now I want to talk about some parts of the map in more detail. And just to answer one question up front: I’m sure this map will change. I’m guessing that in the process of writing these blog posts and fielding questions and comments, I’ll identify gaps and adjustments that will make the map more complete. Diagnostic test development on the Map of Biomedicine. Grayed sections do not apply. You go to the doctor and get an order for a test. It could be as common as blood workup for cholesterol, or as specialized as sequencing of BRCA1/BRCA2 genes to assess your risk for developing breast cancer. You go somewhere else to give a blood sample or get an imaging scan. Your doctor gets the test results and then tells you the outcome. But how do tests get created in the first place? Obviously it starts with a medical need to be able to detect a disease or predict a future risk of disease. Usually what happens next is that a researcher, who may be at a university, a government lab, or in the R&D group at a biotechnology or diagnostic company, discovers a way to test for a condition, using assays that they run in their lab, or that have been sent to other labs to run. As an example, consider the test for mutations in the BRCA1/BRCA2 genes that indicate an increased risk of breast cancer. This is the test that produced the results that caused Angelina Jolie to get a preventative double mastectomy last year. If a woman has those mutations, her risk of getting breast or ovarian cancer can be quite high, in some cases over 50%. Video: "BRCA Gene Mutation Facts and Statistics" by Myriad Genetics. The discovery that BRCA1 was linked to cancer was made by a Mary-Claire King, a geneticist at the University of California at Berkeley, in 1990. BRCA2 was discovered several years later. A private company, Myriad Genetics, was founded in Utah in 1992 and pursued research which included sequencing those genes. Myriad filed patents on those discoveries and developed a diagnostic test. In a future post, I’ll address the situation around gene patenting how it affected the development of these tests. Now here’s where you might be surprised: You would think that, much like the process for drugs, diagnostics have to go through rigorous clinical testing to be marketed for use in clinical care. That is certainly true for tests that are run in diagnostic labs like Quest and LabCorp. The Food and Drug Administration (FDA) has several types of regulations that address this, including Premarket Approval (PMA) and 510(k). In general, these regulations require that diagnostic tests be developed under strict controls and be subject to clinical studies to show that they work as intended. But the BRCA1/BRCA2 tests that Myriad sells never got that kind of approval. There is a separate set of regulations that allows companies to perform what are called laboratory-developed tests (LDT), which are sometimes called “home-brews.” This means a company like Myriad can create a test, perform that test in their own lab, and market it to physicians and hospitals without being subject to regulations like PMA or 510(k). The lab itself must be compliant with a set of regulations called Clinical Laboratory Improvement Amendments (CLIA), which imposes standards for handling of samples and tracking of lab and testing information. But CLIA doesn’t say anything about the clinical utility of the test. 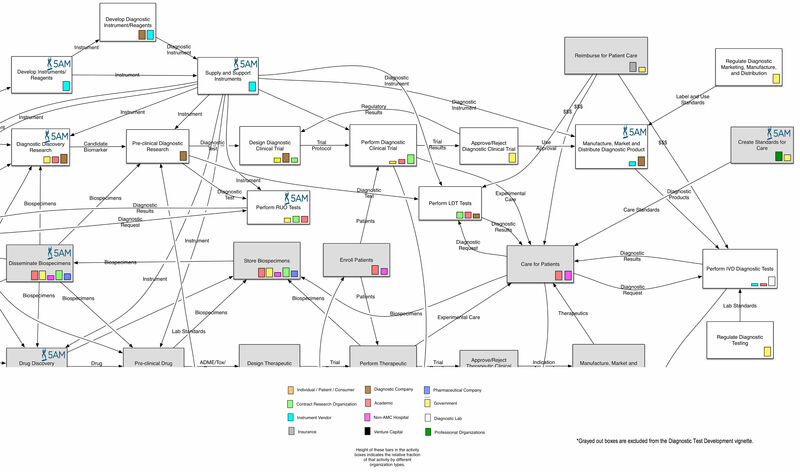 Diagnostic test development is a vast, complex topic, which could easily be the subject of its own blog series, complete with its own nuanced map. I’ll pick up the subject again in the next Map of Biomedicine post. Let’s take a look at the structure of the map itself. It is modelled after what is called an information architecture, although I’ve taken some liberties with that strict definition. The boxes represent activities. The arrows represent flows between those activities. In some cases they are flows of information, but can also be things like money or laboratory instruments. The little colored boxes indicate how much of the activity is performed by different types of organizations. I’ve taken the liberty of putting the 5AM logo in places where we do work to give you a sense for how we fit into the map today. However, new technologies, projects, and collaborations expand the breadth of our experience. Give us your feedback on the Map of Biomedicine in the comments below or broaden the discussion via Twitter and Facebook.